The AX Series features a smooth, warp-free white Melamine laminated board with black edges. 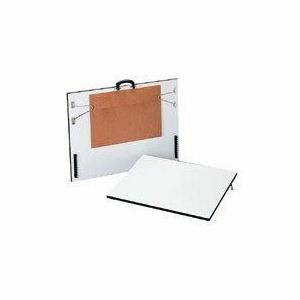 The non-slip tractor feet firmly hold the drawing board at a comfortable angle. For added convenience, a contoured handle makes it comfortable to carry. Each board is supplied with a heavyweight red fiber expanding envelope that can be attached to the underside of the board if desired.